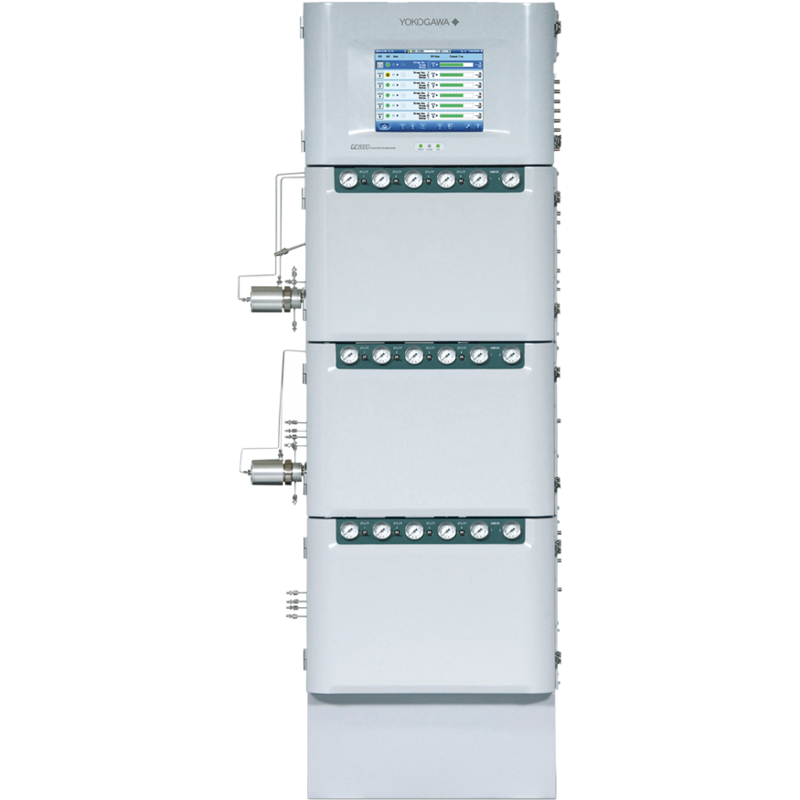 The GC8000 is a process analyzer that uses gas chromatography to measure the composition of multiple components in a stream. Engineered with reliable electronics and intelligently designed columns and valves, the GC8000 improves ease of maintenance while reducing operating costs. 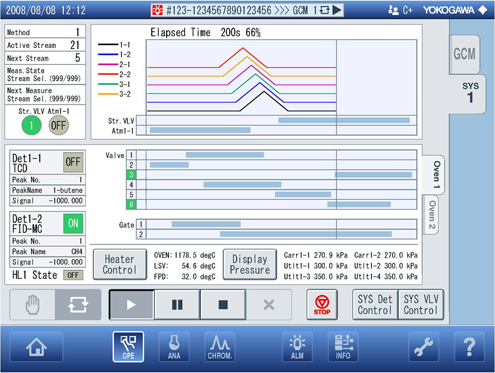 Its intuitive touchscreen HMI with system diagnostics reduces operation and maintenance headaches, maximizing measurement accuracy, reliability, and uptime. 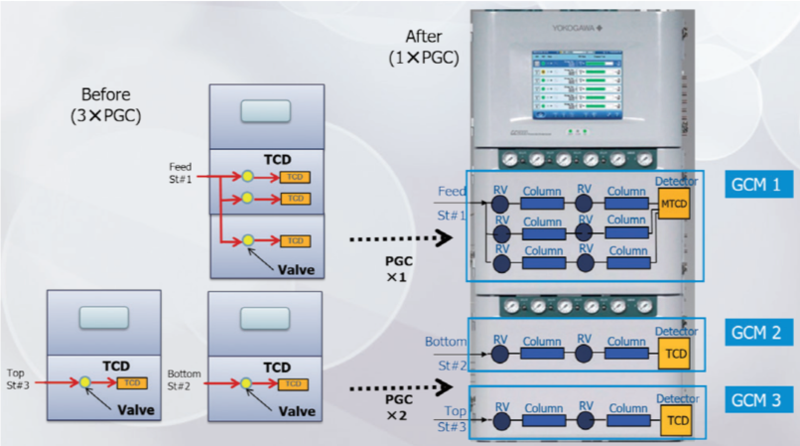 GCMs are virtual GCs within one analyzer, eliminating the need for multiple GCs. 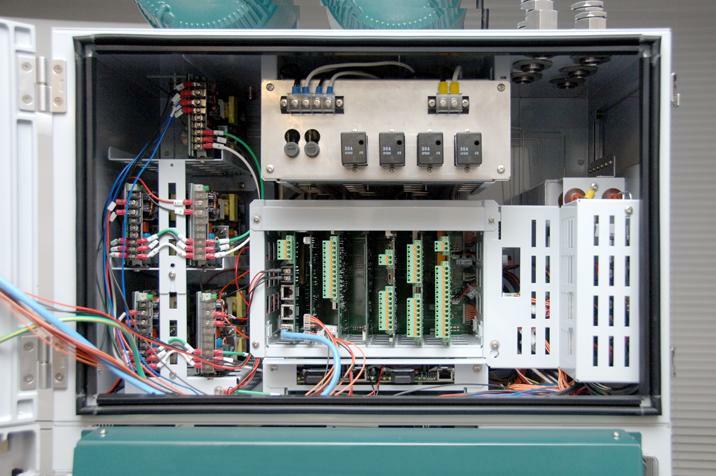 The GC8000 has a control module for each GCM, each with its own system clock. These modules then process information to a single HMI, where it is easily available. 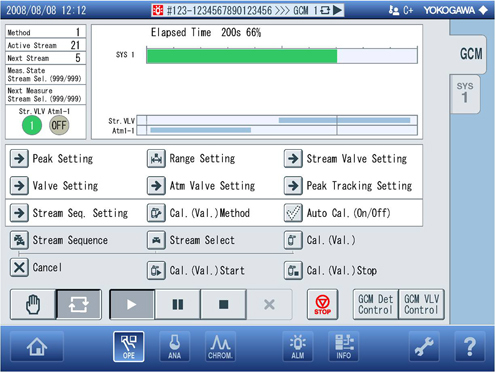 The menu system on the GC8000 is easy to navigate while offering all of the analysis and diagnostics tools needed. It has a built-in 12-inch color touch screen display that simplifies maintenance and operation, allowing technicians to easily access analytical parameters and measurement results such as trend displays of KPIs and gate and valve times. Chromatograms are also easily called up to compare analysis performance against stored chromatograms or a reference calibration chromatogram. 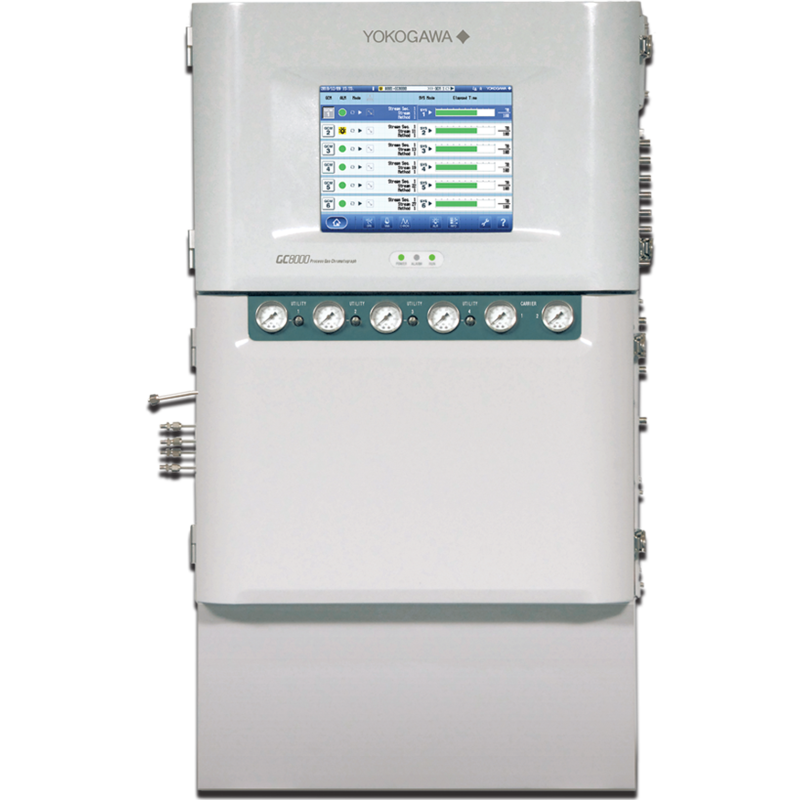 The GC8000 also includes Yokogawa’s ASET (Analyzing Server Engineering Terminal) software, which allows technicians to access most of the HMI’s features remotely from a PC. 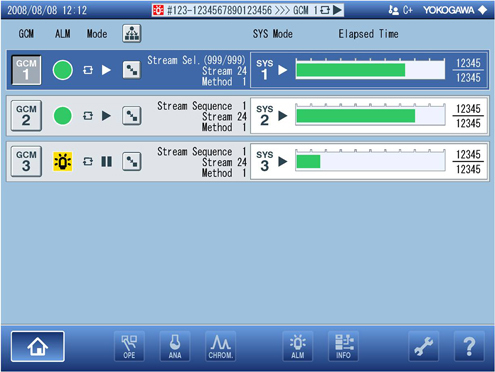 The software watches analyzer parameters and notifies the user if maintenance is required. 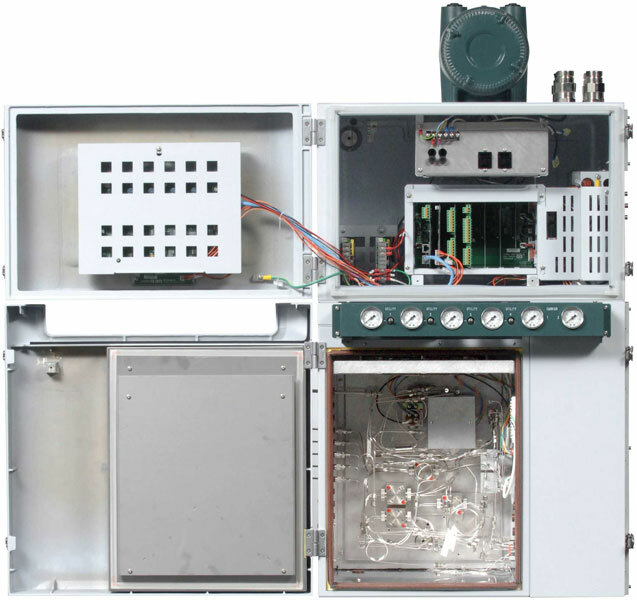 Reliable electronics reduce the need to replace the power supply or control cards while offering modularity to expand or exchange the analyzer’s I/O capabilities. The Smart Oven design makes components easy to access and replace. Gas injection valves are designed to perform around one million operations, extending time between replacements. High sensitivity TCD (thermal conductivity) allows a TCD to measure in places that FIDs and FPDs would normally be used, reducing total analyzer and MRO costs. Download and complete the Application Data Sheet to request a quote. * The value may vary depending on the specifications and conditions. For details, contact Yokogawa. The GC Module (GCM) is a concept where all the parameters and functions of a specific GC application are gathered under one section. For analyzers tackling more than one GC application, this allows everything to be segregated into individual virtual GCs for much easier understanding and maintenance. No longer will the technician need to wonder which valve or peak setting applies to which portion of the GC's application. And navigating between the GCMs is as simple as touching the GCM tabs on the screen. One example of how the GCM design can help is with Parallel Chromatography. Parallel Chromatography is a powerful tool for process GCs that can often reduce analysis cycle times and hardware complexity. But until the GC8000, the implementation of parallel chromatography was cumbersome and difficult as the software for the different parallel chromatography segments were not segregated from one another. This complexity limited the ability of parallel chromatography to be utilized to its full potential. The GC8000 avoids this confusion and complexity by using individual SYS configurations (system clocks) for each individual mini-applications (often called applets). The communications network of the GC8000 is based on the industry standard Ethernet structure to provide flexible yet secure transmission of data to GC maintenance workstations and the plant DCS system. The GC8000 can be set up for either a single Ethernet network or a redundant network with two completely isolated Ethernet networks if desired. Built-in native Modbus TCP/IP protocol support for network communications eliminates the need for communication gateways to DCS in many situations. Not only does this simplify the network architecture, but it also removes a potential point of failure in delivering analytical data to the DCS. For communication systems that still require serial Modbus gateways, the GC8000's ASGW is available. The GC network can even be expanded to include the Advanced Analytical Instrument Maintenance Software (AAIMS) that provides real-time asset maintenance management functions for a wide range of on-line process analyzers such as pH and O2 as well as GCs and FT-NIRs. AAIMS improves the process analysis efficiency by accurately assessing and displaying the KPIs of each analyzer through real-time data acquisition combined with statistical quality control (SQC) analysis. It also provides a common graphical interface for all the plant's analyzers for validation checks and alarm reporting. Loek van Eijck, Yokogawa, The Netherlands, questions whether rapid analysis of gases and liquids can be better achieved through use of a gas chromatograph or near infrared analyser. Conventionally, the liquid and gas components such as those broken down by naphtha crackers have been measured by a process gas chromatograph (PGC), with the subsequent measurement values then being used for control purposes.